Since the launch of Bud Light Lime-A-Rita back in 2012, Anheuser Busch has been continuously expanding the Rita franchise by releasing new flavors every once in a while. One of the exciting flavors that is part of the Rita family is Raz-Ber-Rita, which has the great taste of Bud Light Lime, delightful margarita, and refreshing raspberries. This is great for those who are fond of raspberries and the Rita series because they do not have to spend time preparing and blending ingredients to come up with a great drink. With the Bud Light Raz-Ber-Rita, you can just grab a can (or more), get some ice, combine in a glass, drink and enjoy. Below are the latest Bud Light Raz-Ber-Rita prices. The Bud Light Rita drinks are brewed from a combination of the finest ingredients. These drinks contain some barley malt, non-malted cereal grains, and some light hopping before going through the process of filtration. After that, they are blended with Bud Light Lime and other ingredients to come up with a great margarita flavor. Being one of the flagship brands of Anheuser Busch, Bud Light is distinguished for their excellent beers which cater to both men and women. The Rita franchise, however, is marketed towards women because of the fruity margarita taste. However, it is also recommended for men who want a sweeter alternative to the usual beers that are available in the market. In fact, a can of Bud Light Raz-Ber-Rita should not be taken for granted because it has 8% alcohol by volume. So, it may taste sweet, but it should also be taken in moderate amounts. 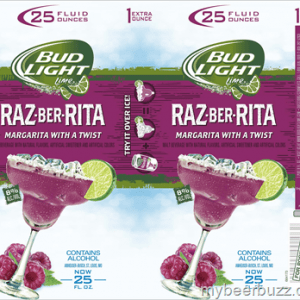 If you just cannot get enough of Bud Light’s fruity Ritas, then you should definitely try this one. The Bud Light Raz-Ber-Rita, as well as other flavor variants, can be best enjoyed over ice. However, you can also come up with your own mixed drinks to take it up a notch and enjoy the drinks in different ways. Feel free to experiment with flavors, but below are some ideas that you can get inspiration from. Using a cocktail shaker, combine grapefruit juice and cranberry juice. Put some ice and shake vigorously. Once chilled, add half a can of Raz-Ber-Rita. Strain and pour into a glass with more ice. Pour the orange juice into a tall glass with ice. Then, add half a can of Raz-Ber-Rita, or more until the glass is almost full. Add a splash of grenadine but do not stir for a beautiful effect. Garnish with a slice of orange and a maraschino cherry before serving. Using a cocktail shaker, combine the lemon juice, honey syrup, and ice. Shake it vigorously until chilled. Next, add half a can or 4 ounce of Bud Light Raz-Ber-Rita. Strain and pour into a glass with ice. Garnish with lemon wheel and raspberries before serving. In a large pitcher or punch bowl, combine all ingredients and mix well. Add ice into the bowl, just enough to chill the mixture. Add the fruit slices for garnishing and for additional fruity flavor. You can also put ice in individual glasses before pouring a serving of the Mix-A-Rita punch for a more refreshing drink.